Boxes filled with photographs, negatives and more line shelves that reach ceiling-high in the Palace of the Governors Photo Archives. To the three-person staff responsible for archiving the contents, the process must sometimes feel like bailing out the ocean with a bucket. At high tide. So you can understand how mysteries might lie hidden for years, decades even. But the promise of a new discovery keeps the archivists pulling the boxes down, tugging open their lids and hunting through their contents. Last May, Daniel Kosharek had one of those dreamed-of a-ha moments. 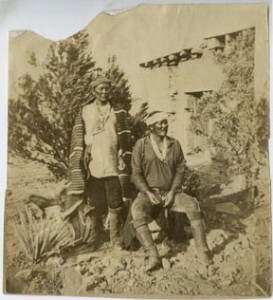 Navajo war chief Manuelito (seated) with another Navajo war chief, identified in the photograph as Cayetanito, ca. 1870s. The Photo Archives is full of undiscovered treasures like the Manuelito portrait. With a collection of more than 800,000 images and an antiquated cataloguing system, which the current staff of three is rapidly working to update, there are wonderful gems still hidden away in boxes and cabinets, waiting to be discovered. … Each box is like a gift waiting to be opened on a special day. 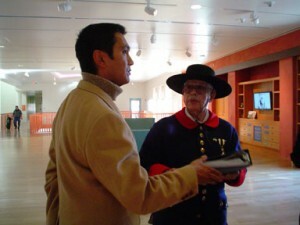 Manuelito’s monumental role in Navajo life includes his 1866 surrender to the Bosque Redondo reservation (and his subsequent escape), an 1868 meeting with President Ulysses S. Grant in Washington, D.C., and an 1880 meeting with President Rutherford B. Hayes in Santa Fe. On the Navajo reservation, his name is carried by the Manuelito Navajo Children’s Home, the Manuelito Chapter House, and the Chief Manuelito Scholarship. The photo Kosharek discovered shows Manuelito sitting beside another Navajo war chief identified as Cayetanito. Historians know of only a handful of Manuelito portraits, taken by photographers Charles M. Bell, George Ben Wittick, and possibly William Henry Jackson and John Gaige. You can also pick up the latest El Palacio for $8 at any of the Museum of New Mexico shops (Museum of Indian Arts & Culture, New Mexico History Museum, Museum of International Folk Art, and New Mexico Museum of Art), or for $10 (postage added in) by calling 505-476-1126 or e-mailing elpalacio@state.nm.us. Here’s a not-so-subtle hint: You can support scholarly research at our museums and deepen your knowledge of New Mexico’s art, history and culture by springing for a subscription. Do I hear jingle bells? Johannes Gutenberg would be so proud. So is Tom Leech, curator of the Palace Press. His newest addition to the Press’s collection of 10 major presses — still awaiting formal acceptance — is a Bobcat Press built in the 1970s by Cedar Crest’s Richard Hicks, a machinist turned sculptor who’s spent much of his adult life building replicas of early presses. The new star of the Palace Press Show is one of about 30 Hicks built out of hand-worked mahogany and poured-brass fittings. He built this one for the Albuquerque Children’s Museum (now called Explora). It was later transferred to the Albuquerque/Bernalillo County Library System’s Center for the Book, which donated it to the Palace Press. The Palace Print Shop and Bindery, as it’s formally known, is both a New Mexico History Museum exhibit of the state’s publishing history and a working press crafting small batches of books. Its most recent publication is former Santa Fe Poet Laureate Valerie Martinez’s This Is How It Began, featuring marbled-paper covers created by Leech and a calligraphic title page by Santa Fe artist Patty Hammarstedt. 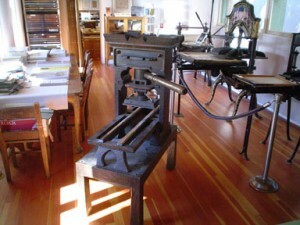 Housed in what were once the stables for the Palace of the Governors, the Palace Press features a recreation of famed artist Gustave Baumann’s print studio, a variety of historic presses and more than 200 fonts of type commonly used in 19th- and early 20th-century publications. Each piece of paper was individually slipped into the tympan, which was then lowered onto the plate. The package would be literally pressed by pulling a handle that engages a large wooden screw, thrusting the platen downward. Though it’s a tad messy and needs a bit of strength to operate the lever , the Bobcat could be – ahem – pressed into service as soon as Dec. 10 during the annual Christmas at the Palace event. 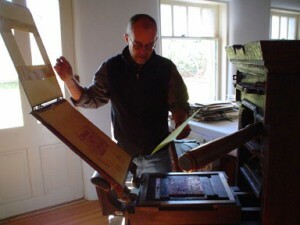 Traditionally, visitors are invited to produce a holiday card using a press from the collection. “It’s a size that’s kid-friendly,” Leech said of the Bobcat. Hicks, one of the heroes of the Battle of Iwo Jima, was still pulled by his love of building presses as recently as 2006, when he told Pamela S. Smith, author of Passions in Print: Private Press Artistry in New Mexico 1834-present, that he just might have to get out his wood-working tools again. 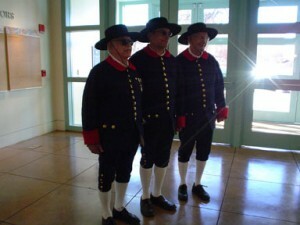 The New Mexico History Museum today played host to a contingent of accurate-to-the-period-dressed representatives of the Sons of the American Revolution. The group arrived eager to see the new exhibit The Threads of Memory: Spain and the United States (El Hilo de la Memoria: España y los Estados Unidos), in particular for its final section’s depiction of Spain’s role in helping the revolutionaries win their war against Great Britain. That they did so in period style enthralled — and sometimes perplexed — other museum visitors, many of whom did the first thing any modern American thinks of in such situation: Pull out the cell phone and snap a pic. Why did they pick today for a visit? With the group’s national president, David Sympson, in town, the time seemed right to see firsthand some of the documents that form their heritage. So, after lunch at the Osteria restaurant, they strolled over to the museum, having stashed their 9-foot lances in a room at the eatery. “(Deputy Director) John McCarthy told us beforehand, `Don’t bring any weapons,'” said SAR New Mexico President Gene Tomlinson. He was joined by the Santa Fe Chapter president, Charles Martinez y Vigil, and George C. Garcia. With their brass-buttoned knickers and Zorro-style hats, they were authentic from their 1780 Santa Fe Presidio garb down to their personal DNA. Tomlinson claims an ancestor who fought in the American Revolution; Martinez y Vigil and Garcia claim ancestors who contributed to Spain’s bankrolling of war against the Redcoats. A primary goal of Threads of Memory is to deepen Americans’ knowledge of just how much muscle Spain exerted in the Americas in the centuries that are often taught from an East Coast perspective. From the earliest explorers in the 1500s, through the establishment of Santa Fe in 1610, the colonization of today’s New Mexico, Florida, Texas and California, and the multi-nation efforts in the American Revolution, Spain has made Americans far more Spanish than many believe they are. In March of 1780, Carlos III decreed that to sustain the war against England, “his vassals in America” were to contribute a one-time donativo (donation) of one peso (approximately $30 by year 2002 standard) per Indian and other castes and two pesos per Spaniard and noble. Collectors (such as alcalde mayores or military commanders) went to towns and pueblos in the New World and collected one peso per Indian over 18 years old and other castes, and two pesos from each Spaniard. Donativos were collected from soldiers and citizens throughout Cuba and Spain’s hard-pressed North American colonies, including the provinces of California, New Mexico, and Texas. 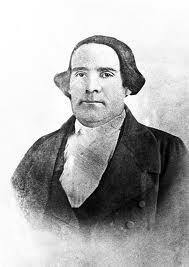 The SAR recognizes a variety of ancestral involvement in the war as worthy of membership: service in the Spanish military, the militia, or as Indian auxiliaries; donating money to defray expenses of the war; Spanish cowboys (in Texas) who drove cattle to feed the American colonial troops; and mission priests who led public prayers on behalf of Spain’s support of the American Revolution. Upon entering the exhibit, the SAR contingent proved themselves true students of history by becoming engrossed not only in the exhibition’s final section, but by creeping through its length, magnifying glasses in hand. We were delighted to welcome them — and just as delighted to give our unsuspecting other visitors an interesting dinner-table tale to share later. On Tuesday, New Mexicans elected the nation’s first Hispanic woman governor. Regardless of your personal political leanings, that’s a historical milepost and, given that we’re in the business of celebrating our history, we’re taking the opportunity to remember another Hispanic who made history as governor of New Mexico. A photo of Donaciano Vigil, taken by Albright Art Parlors, 188-82?. Palace of the Governors Photo Archives, No. 011405. Born in Santa Fe in 1802, Donaciano Vigil chose when he turned 21 to make the military his career. After U.S. conquest of New Mexico in 1846, Vigil’s acceptance of American rule influenced other Hispanos to recognize the reality of the federal presence and calm largely political unrest in the territorial period. During the earlier Spanish colonial period, government and church officials were careful to preserve historical records. After arrival of the Americans, however, it fell to Vigil to champion the cause of saving historical records. As New Mexico’s first civil governor, Vigil organized archival records and made it his cause to preserve New Mexico’s history.